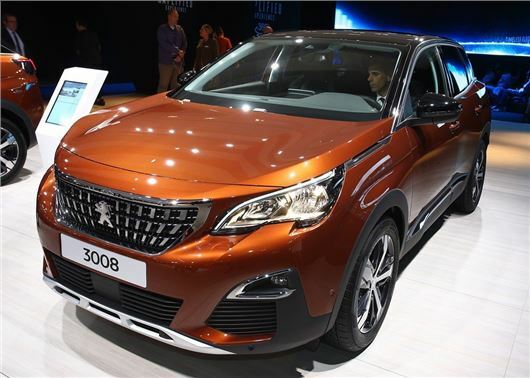 The Peugeot 3008 SUV has gone on display for the first time at the Paris Motor Show 2016. The SUV will replace the 3008 MPV in Peugeot’s line-up and go on sale in October from £19,500. ﻿The new Peugeot 3008 is bigger and offers more interior space than the MPV it replaces, with 36mm more headroom for those in the front and back. The boot is larger too, measuring 520 litres, 90 more than before. Despite the extended dimensions, the SUV weighs 100kg less than the old MPV, thanks to the use of aluminium and steel in its construction. The rear seats can be folded completely flat for stowing large items, while exceptionally long items can be loaded by folding the front passenger seat forward. With the second row of seats flattened, the 3008 will offer a van-rivalling 1580 litres. Optionally, the electric tailgate can be opened hands-free by waving a foot under the rear bumper. The interior gets Peugeot’s latest i-Cockpit system, with a wraparound dashboard and 8.0-inch touchscreen that will automatically connect and mirror a smartphone display. Wireless charging is available too, for compatible devices. A large 12.3-inch high definition screen replaces the traditional instrument binnacle. As a result the driver can customise the instruments, to display route directions, maps and fuel levels. A broad range of safety technologies will be available, including adaptive cruise control, lane keep assistance, autonomous emergency braking and drowsiness monitoring. Furthermore there are convenience technologies like automatic lights and wipers, active parking assistance and a 360 degree parking camera system. From launch buyers will be able to choose from a 1.2-litre 130PS PureTech petrol, a 1.6-litre 165PS THP petrol, a 1.6-litre BlueHDI diesel with 120PS or a 2.0-litre BlueHDI producing either 150PS or 180PS. Official fuel economy figures are to be announced, but the 1.6 BlueHDI is likely to be the most frugal with emissions of 100g/km of CO2.